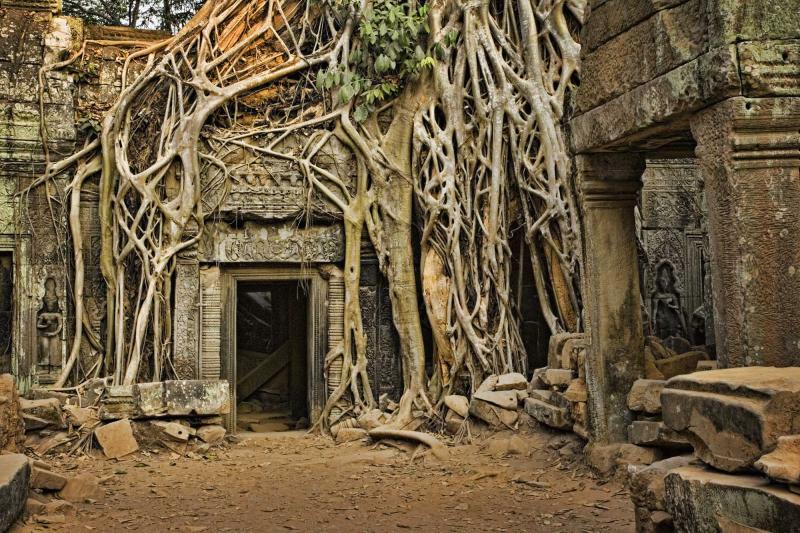 You no longer have to imagine ancient palaces and temples awash with jungle foliage. 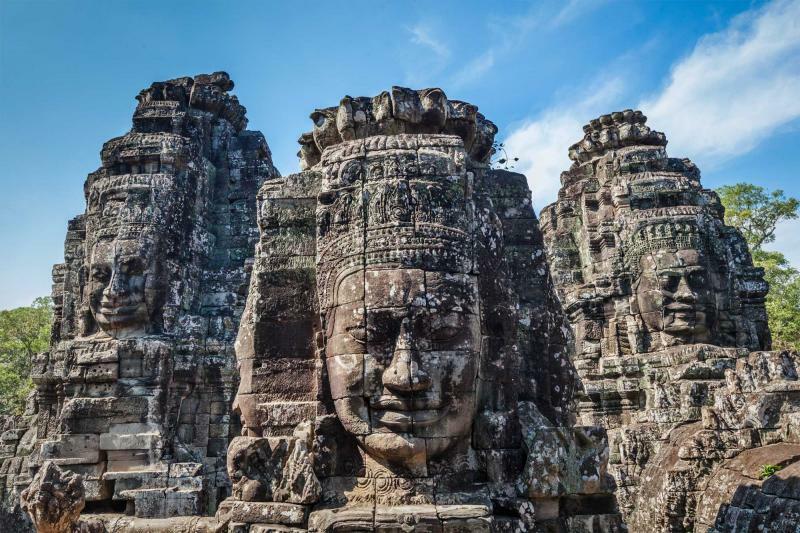 This custom tailored tour will take you through the imperial majesty of Vietnam, Cambodia, and Thailand. From the quiet charm of Hoan Kiem Lake at the center of Hanoi to the shimmering emerald Buddha in the heart of Bangkok, experience the marvelous stone guards at the tomb of emperor Minh Mang and witness the celebrated splendor of Angkor Wat. You will discover the lavish histories of Southeast Asia’s dynasties while indulging in modern luxury. 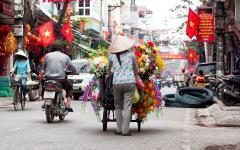 Your discovery of the imperial cities of Southeast Asia begins with your arrival in the modern capital of Vietnam, Hanoi. The city is charismatic with its mixture of high-rises which connote contemporaneousness while its tree-fringed lake brings a sense of calm and tradition to the stretch of energetic neighborhoods. 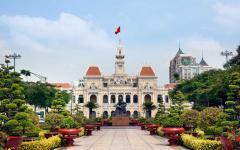 Tour through Hanoi to discover the history of the city that stretches back over a millennium. 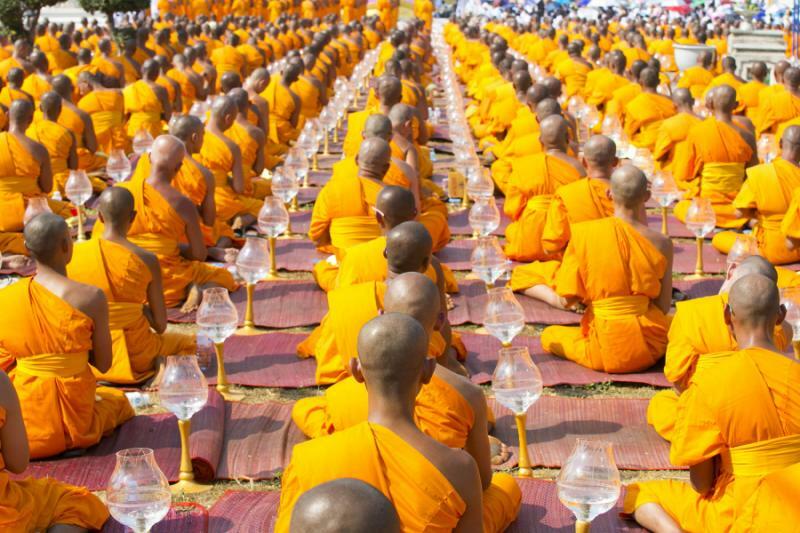 Experience the gregarious culture whether within the temples or the aromatic restaurants. 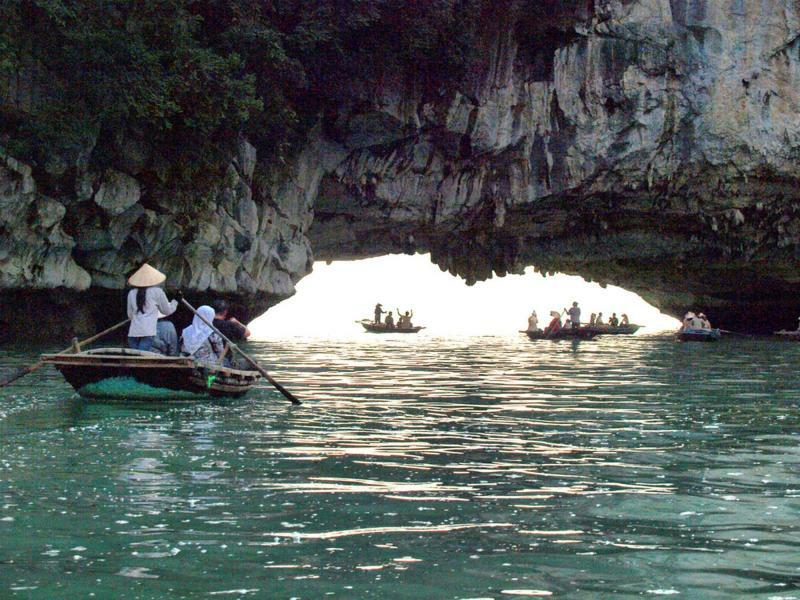 The following day you will indulge in a day trip to Ha Long Bay where the limestone islands create a unique and wondrous landscape along the South China Sea. 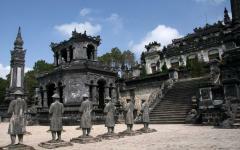 Transfer to Hue where the imperial past of Vietnam is situated within the Old City. Travel along the Perfume River before visiting the tombs of past emperors, each constructing lavish architecture and artistry to commemorate their rule. Once in Ho Chi Minh City you will witness the commercial center of Vietnam. The streets are filled with an effortless buzz along the Saigon River. You find the range of history within the Reunification Palace and outside of the city at the Cu Chi Tunnels. 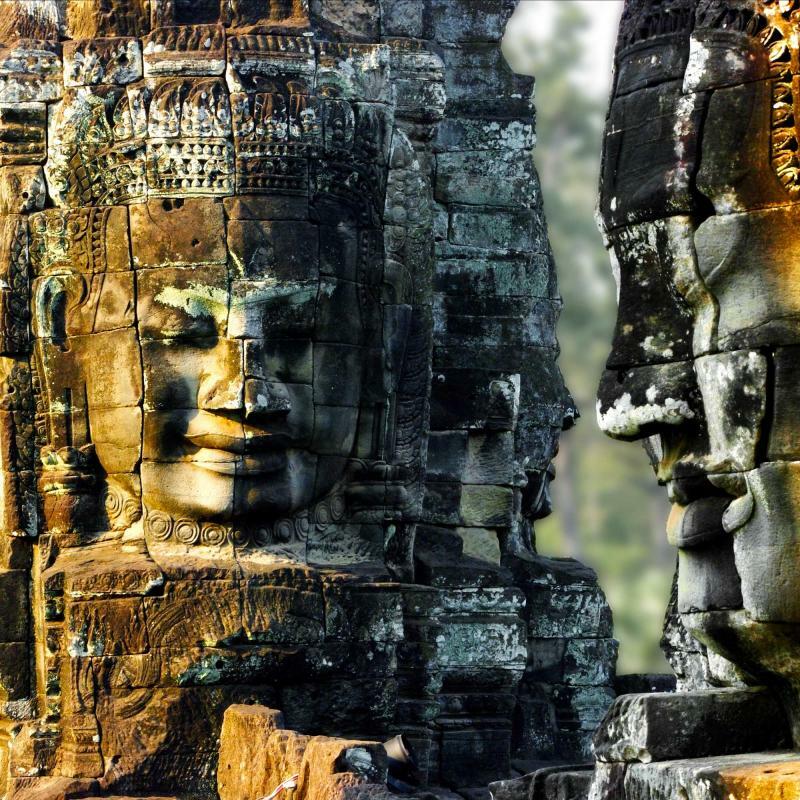 Once in Siem Reap, Cambodia you will spend two days traversing the celebrated temples of the Angkor complex, from Ta Prohm to Angkor Wat itself, each temple showcasing the history, grandeur, and dedication of the Khmer empire. 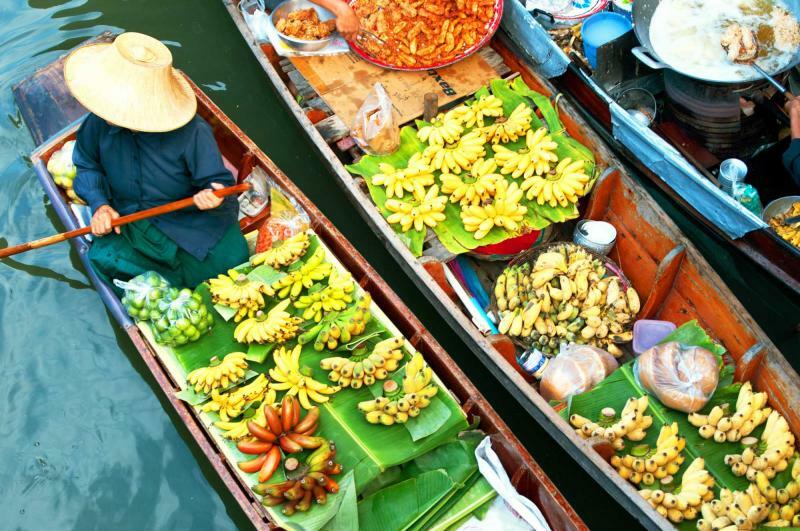 Arrive in Bangkok, Thailand, a city known for its endless energy and where you can find the country’s rich history located at the heart of the Chao Phraya River. A tour along the momentous waterway brings you to the Grand Palace complex, filled with opulent architecture and majestic temples. From Bangkok you will be taken to the airport for your return flight home. 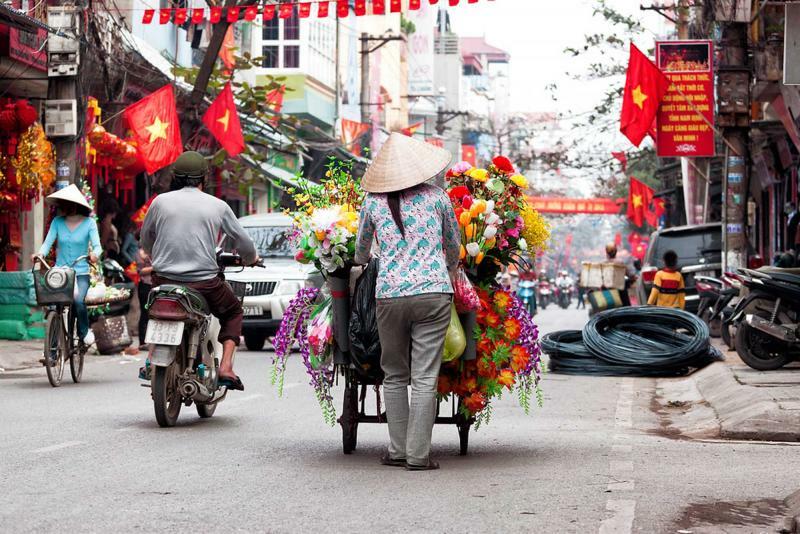 The city of Hanoi begins to bustle with life before you have even landed. The mixture of tradition and modernity overflows with grandeur. You are met at the airport by a private transfer who takes you to your hotel where you can settle into luxury while witnessing the sensational combination that Hanoi holds onto so well. Hanoi’s history dates back almost a millennium and can be seen in the pride with which the locals hold on to their treasured pasts in the wake of the modern streets. You see a woman with a conical hat stroll down the walkway. Her bright blue shirt stands against her dark pant and open sandals while a long bar stretches over her shoulder. She is balancing two shallow but wide containers, each filled with produce, from lemon grass to spinach, connected to the poll that rests on her shoulders within the rising reflection of the skyline. After breakfast you are met by your guide at your hotel ready to venture out into the streets of the city to witness the splendor of culture, rich from an expansive history. 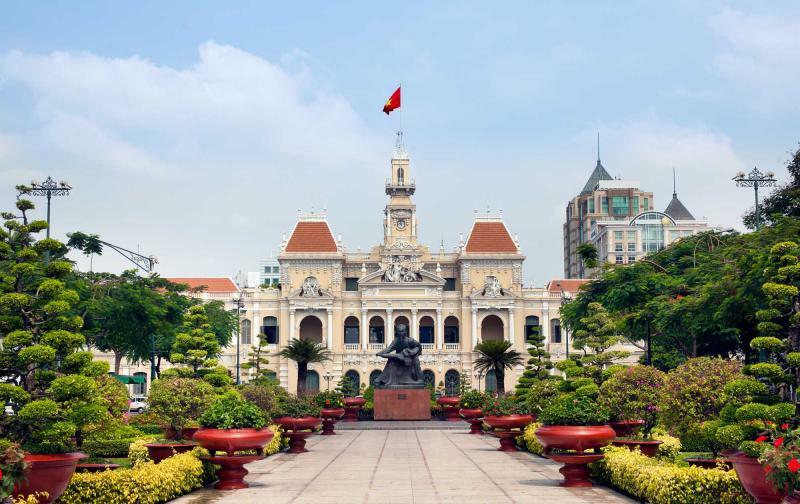 Hanoi’s Old Quarter is situated near charming Hoan Kiem Lake, where French Colonial architecture continues to line the wide, tree-lined streets, and where the Opera House has shined like a pearl since the early 1900s. The gothic themes around the doors and domes are reinforced with pillars within the classical French architecture; it is also the largest theater in the country. Reaching deeper into the city’s past, you will find the One Pillar Pagoda rising gracefully from a lotus pond. The temple was constructed in the 11th century and has become one of Vietnam’s most iconic images, made from wood and crafted to look like a lotus blossom. Stone steps lead to the entrance terrace that emanates a scent of spice from burning incense that is both welcoming and captivating. In the evening you can indulge in an authentic taste of the city at Bun Cha named after the traditional dish of grilled pork and noodles that will offer you the tenderness of the meat, the noodles, and the culture. The morning brings with it the sunshine and the elegant aroma of coriander as you are met by your private transfer and taken to the majesty of Ha Long Bay for a day along the turquoise water. Climb aboard a boat that will take you out into the South China Sea along one of the most treasured natural wonders of Vietnam filled with over 1,600 limestone islands throughout the archipelago. The breeze brushes through your hair while the sea’s scent is both sweet and salty all at once. 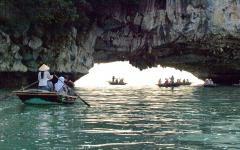 Stop at Bo Hon Island to explore Sung Sot Cave, also known as Surprise Cave. At the edge of a quiet path that lingers beneath the comfort of shaded trees you will come to the open grotto with a ceiling standing over 90 feet high. Press your hands along the walls and notice how smooth the stone has become over time, almost as if sanded to perfection. The inner chamber feels like you have stepped into a tranquil castle with artwork made from the earth itself; rock formations have been twisted into poses. In the early evening you will return to Hanoi but for now you can celebrate the beauty that has come naturally to this unparalleled spot of the world. After breakfast you will once again be met and taken to the airport for your brief flight to the old Imperial City of Hue. The ancient city was once the capital of the Nguyen Dynasty in the 19th century and continues to mesmerize locals and visitors alike in its connection with the past and the architectures’ continued beauty. Soon you will step onto a dragon boat and drift down the Perfume River. The colors of the dragon are bright, helping to ward off spirits and to bring good fortune for those who step aboard. The sweet breeze brings you to the banks of the seven-story Thien Mu Pagoda that rises in concentric hexagons. Built in the 19th century and displaying a golden Buddha image within the interior, you can walk through the pillars that stand atop the tiered stairs framing the tower at the top. The gardens are manicured in a way that brings a serene ambience to the riverbanks and the temple itself which has become a monument for its beauty and history among local monks. 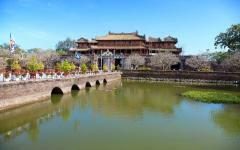 The Old City of Hue continues to shine in the eyes of Vietnam in a connection to a strong history brimming with pride and power. 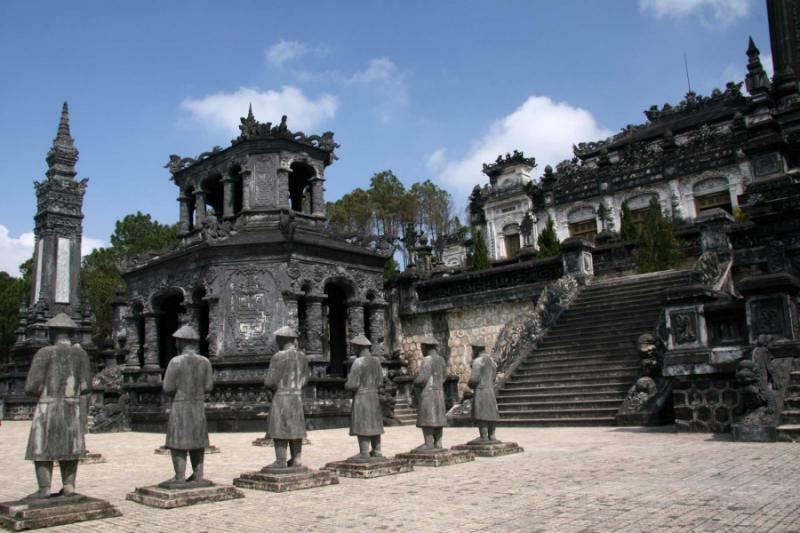 Tour through the remains of what the city once was, now prominent in the tomb of Tu Duc. Constructed in the 19th century, its popularity stems from its impressive edifice, designed by the emperor himself. Follow the path along the shores of Luu Khiem Lake where you can see the small island where the emperor once hunted. But it is within the Honor Courtyard that you come face to face with stone elephants, horses, and Mandarins. Each guard looks out over the stone plaza standing beneath the dangling leaves. Across the courtyard is Stele Pavilion, home to a tablet that weighs 20-tons and was inscribed by Tu Duc who chose to name the tomb in respect to the virtue of modesty. Whether beside the waterfront or strolling along the cobblestones decorating almost the entire complex you will find each step filled with exquisite décor. After breakfast you will be taken from your hotel to the airport by a private transfer for your flight to Ho Chi Minh City, also known as Saigon. The city contains a more modern touch in its neighborhoods and the skyline, spreading along the banks of the Saigon River. The atmosphere is different than Hanoi or Hue, where the commercial capital of the country can be felt in the energetic streets. Within the surrounding palm trees and manicured grass, raining fountain and block architecture, is the Reunification Palace most commonly associated with the fall of the city in 1975. The building is now a time capsule commemorating the contemporary history that continues to mark parts of the country’s modern evolution. The original palace was built in the 19th century, while the current building’s construction was completed in the 1966. Once you enter the varied rooms of the palace you will soon come to the basement. Here you will find a fabulous display of telecommunications, from transmitters to telephones, situated in a way that demarcates the entire conflict, from the placement of maps to the old fans that continue to whirl through the air. Breakfast comes with the aroma of freshly brewed Vietnamese coffee, filling the air with dark roast and decadent flavor. After your meal you will step outside of the cityscape and into the surrounding country to visit the impressive and complex labyrinth of the Cu Chi Tunnels that comprise more than 124 miles of connecting branches and underground hideouts. Your guide leads you through a short section of the tunnel where you can feel the constricting weight of the earth around you, even after the certain sections were expanded to accommodate visitors. Elegantly designed with air filtration systems, and situated deep enough below ground to not be effected by tanks and air support, the tunnels are an impressive and interesting piece of history that continue to wrap beneath the mountains and forests in the cool air underground. When the morning rises over the city you can see the shadow of the skyline drifting along the edges of the riverbanks. 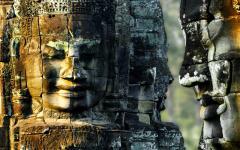 Today you will be taken to the airport by private transfer for your flight to Siem Reap. 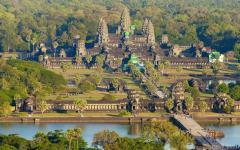 The city sits at the edges of the Angkor complex, home to the Khmer imperial capital that has captivated people from around the world. 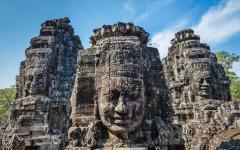 Siem Reap itself sits between rice paddies and the river that was once a collection of villages united under the French. The scent of fresh baguettes fills the late morning air as you settle into your comfortable accommodation. 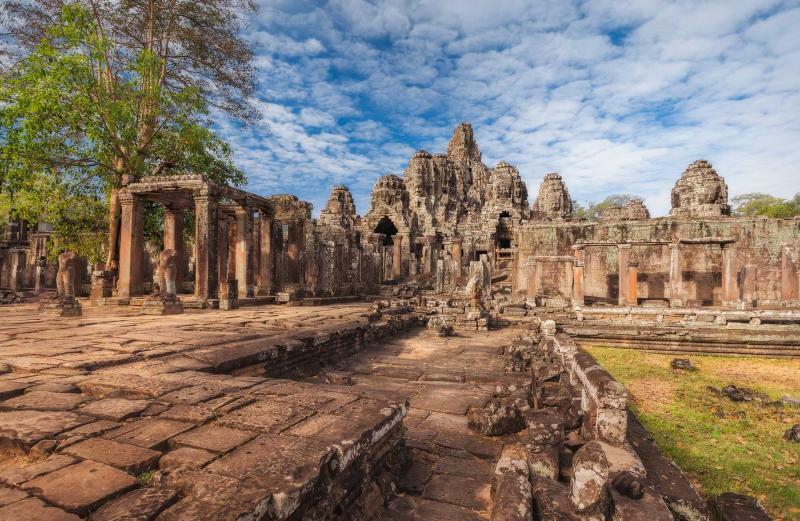 In the afternoon you will follow your guide for a tour of the famous temple complex that has stood for millennia watching over the landscape; some of the landscape even grows through it. 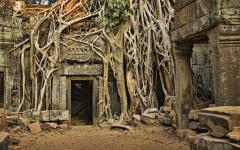 Your visit begins with the unique temple of Ta Prohm whose construction dates back to the 12th century. The iconic image of the temple comes from the wide oak tree standing along the temple’s porticos, with vines cleaving to massive stones and spilling over the ramparts. Thirty-nine towers are connected by a number of galleries within an exterior wall that wraps almost 1,200 feet around the entire structure. In the warm afternoon the light is filtered by the leaves and brings a greenish hue to the day. Whether within the natural growth of the jungle or in the intricately carved reliefs within the halls, the sensational feeling of the remaining empire has only just begun. 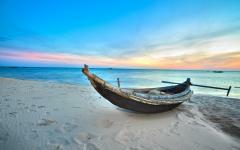 The early hours before sunrise are as energetic around Siem Reap as the morning around Ho Chi Minh City. People are filled with energy and anticipation while the luscious aroma of coffee and baguettes once again drifts through the air. 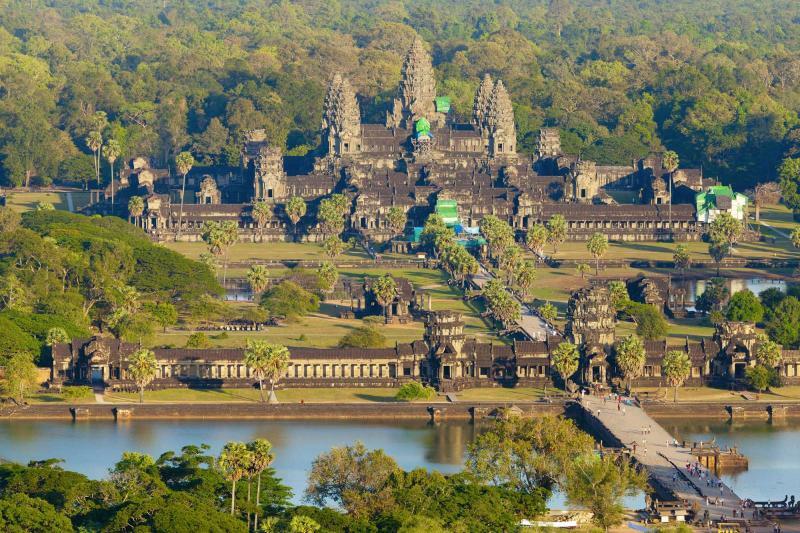 You come to the bridge of Angkor Wat, flanked by large lions to guard the inner courtyard from spirits. The bridge carries you over what was once a strong river system. The stone complex stands on the far side of the grassy plaza reflecting in the pond at its forefront scattered with lily pads. The temple dates back to the 12th century under King Suryavarman II. As the sun rises over the five central shrines, the light mixture of colors turns the temple from a dark shadow to a vibrant outline. 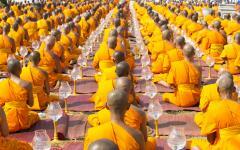 Monks in orange robes begin to appear from the tree line with the gentle repetition of a gong sounding through the air. When you enter the first gallery you find harmonious representations of the gods, men, and animals, carved in every flat surface that wind around the structure. The sandstone no longer looks like a silhouette and instead brings a delicate red to the morning sky. Within the third gallery you notice the roofing decorated with a snake’s body with a lion’s head. The designs highlight the focus and dedication stretching over the entirety of the large temple, showcased in the sunlight. You watch the morning shine through the stretch of trees that line the riverbank before you enjoy a sweet cup of delicious coffee. 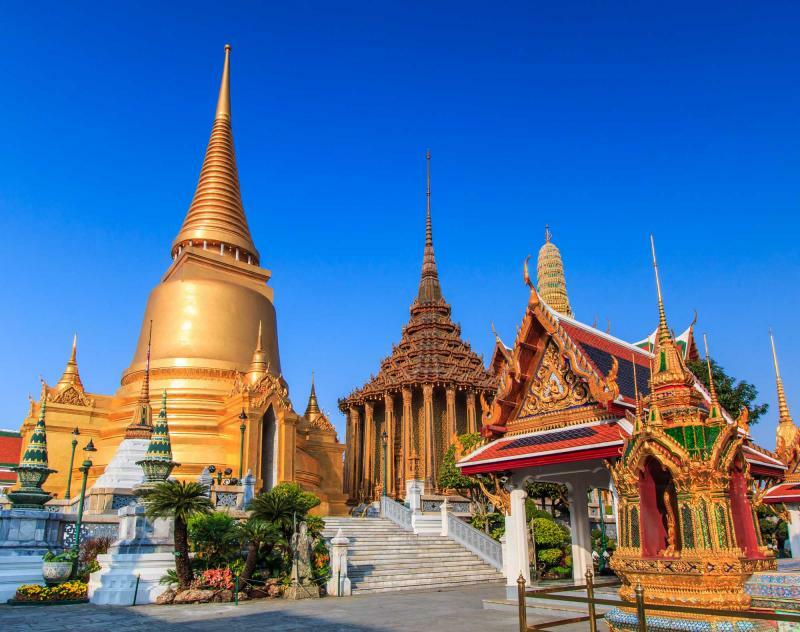 After breakfast you are taken to the airport to catch your flight to Bangkok, the capital city of Thailand where the non-stop energy brings with it modern luxuries draping over the lavish history. Remnants of the skyline can be seen touching the edges of the Chao Phraya River, the oldest highway in the city, while the bustling nature of the streets is subsided by the hidden treasures of calmer neighborhoods where the traditions of shady tree-lined walkways still persist. On Soi Rambuttri you will feel the calm atmosphere of the cobblestone pathway under the swaying shade of the leafy canopy. The horseshoe shaped road is as colorful during the daytime as it is in the evening, emanating phad thai and coconut milk, along with ginger and chili. The golden roof of Wat Chana Songkhram rises over the buildings glistening in the light. When night begins to fall you can watch the street shine by paper lantern. 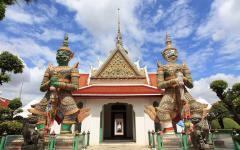 Your first day in Bangkok shares the brimming present and hidden past all along the lavishness of the surrounding neighborhoods. Bangkok’s energy feels endless, day or night, almost dizzying with fun, from the whirling streets to the enchanting riverside. Today you will step onto the Chao Phraya River to begin your tour of the oldest highway in the city, touching the celebrated Grand Palace complex along the way. The cool breeze sweeps across the water’s surface as you drift down the river on your guided tour. Coming to the palace brings with it the sensational blend of European and Thai architecture. The opulent façade is reminiscent of French structures while the roofing brings the tiered, sloping angles and towering spheres of tradition. 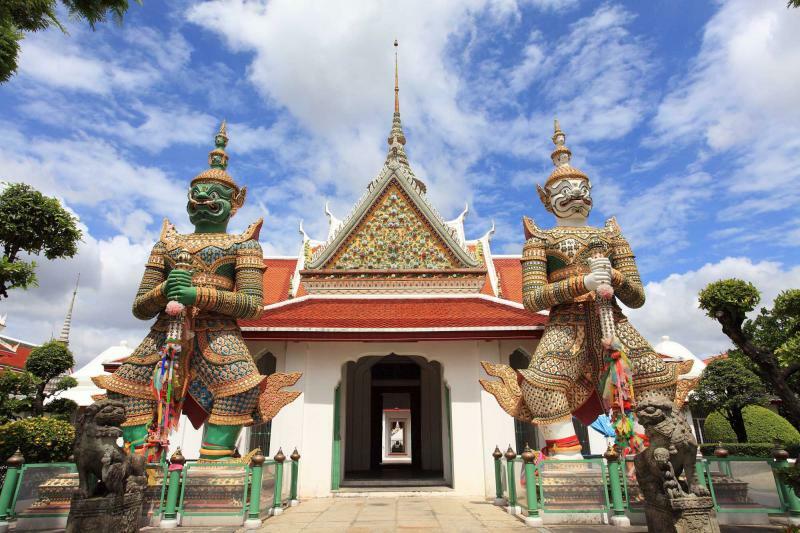 On the palace grounds you will also find the famous Temple of the Emerald Buddha, considered one of the most important Buddhist temples in the country. The outer stupa is gold plated, resembling a bell, while the interior houses the revered image of Buddha in the meditating position carved from a single block of Jade and dating back to the 15th century. The aroma of incense fills the gallery while the Buddha sits with gilded robe which is changed in a ceremony by the king to correspond with the changing seasons. The new day brings a new adventure that will take you far from the ancient empires that once ruled the landscape of Southeast Asia. After breakfast your private transfer will take you to the airport to begin your return journey. You have seen karsts and rivers, temples and caves, tunnels and palaces. The welcoming aromas of ginger and lemon grass soon dissipate. As your plane begins to soar en route towards home you can’t help but think of the grandeur that you are leaving behind but also of the comfort that awaits.